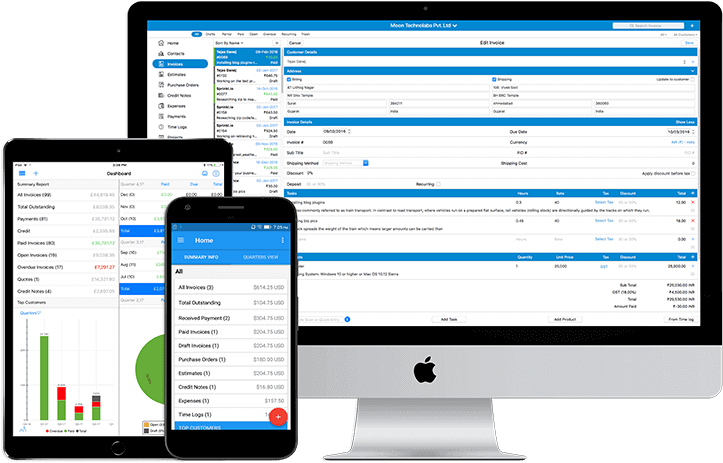 Moon Invoice is recognized as the best invoice app that lets you perform all the business functions starting from invoicing to tracking payment to monthly reports anywhere, anytime. Try it for free and we are sure to remain in your device forever! We are proud to present you the featured app in the App Store. A true solution for all your invoicing worries. We thank you for your continued support and allowing us to achieve a new milestone. 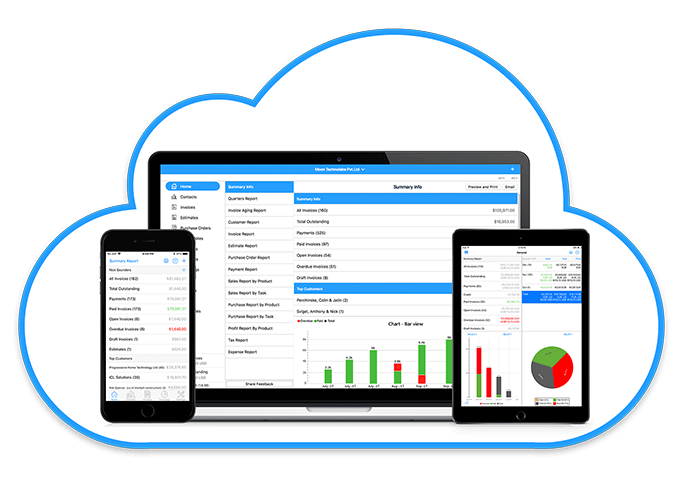 Enjoy the easiest and efficient invoicing or billing solution with the best invoicing app available today to increase productivity and boost growth in your solo venture or business. How Moon Invoice Is Different & Unique From Others? 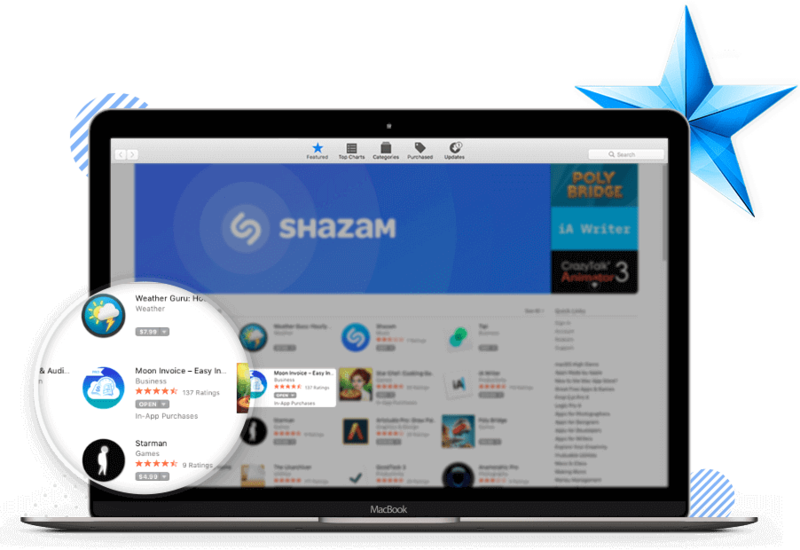 Moon Invoice app being native in nature allows our users to seamlessly access and enjoy features across any operating system. Ever been in a situation where there is no mobile internet network and you can't delay in sending an invoice? Keeping all your invoicing data confidential and safe via secured server services is our forte. Multiple-Device-Data-Compatibility, while keeping the uniform look and feel of your favourite Moon Invoice app. Don't you feel it's a tedious task to transfer or gather data in one place or device all the time? Say goodbye to it. Now sync & access data among multiple devices even while you are on-the-go. Grow your business two-fold in the presence of Hassle-free sync option. Why limit your business's resources & potential when it could excel from every direction? We are versatile in our services. We believe in going everywhere, doing more. Hence, Moon Invoice with multiple presence across all devices and platforms (iOS, OSX, Android, Windows) lets you enjoy the features that will definitely leave you flabbergasted! Look no further because we have left no stone unturned in making Moon Invoice, The online invoicing app that does-it-all. Is there anything that you can't do with Moon Invoice"? 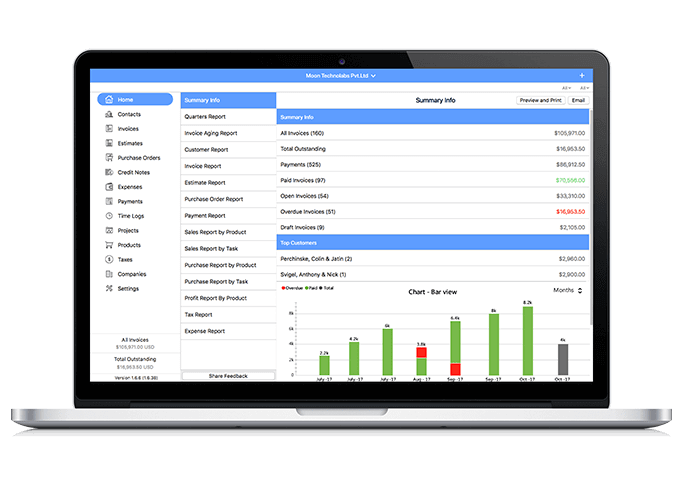 Well, what we meant was, if its anything or everything related to invoicing, then let your Moon Invoice take care of all, may it be, “estimate, purchase order, credit note, expense or time tracker or let managing reports-payments-products & tasks". You Name It And Moon Invoice Does It! Manage invoices in no-time with built-in PDF creation. Set yourself free from handling tax overheads. Option to set default tax format. Check status and instant search/ filter option available. Quickly convert estimates in invoices. Pre-set statuses like approved, on hold, etc. for estimates/PO. Platform to expand the base of business from mobile device with increased visibility to global customers & vendors. Mobile responsive integrated design. Facility to add multiple businesses. Perfect for busy business owners. Can use upto to 2 different signatures. Accept online payment with PayPal. Payment in multiple currencies supported. Add bank details in company settings. Capture time logs using timer. Auto/ Manual calculation of product stock on invoices & PO. Built-in timesheet that streamlines your projects/ tasks. I'm impressed by this version of Moon invoice pro. Very easy to navigate and figure out. Most software I had looked at was expensive than I came across this and it has met all my expectations. Thank you for a product that is very reasonable and effect for my small business needs. I love it!! Great great, i have had absolutley no hang-ups, problems, etc.! Much more user friendly than the that other one that starts with Q. Great Invoicing program, looking forward to the continued updates as the program gets better each update…! Was not a huge fan of Quickbooks, so we turned to Moon Invoice and have not looked back yet….! Highly recommended…! 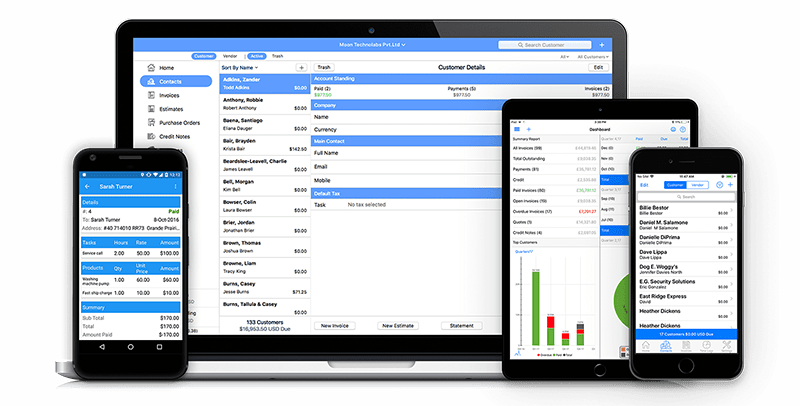 I absolutely love this invoicing & expense (and more) tracking app. I love the display of data. I love the reporting, etc. I LOVE the one-time payment for PRO. I will be using Moon Invoice Pro for a long long time. Keep up the good work guys, I will def be referring you to my professional network of phtographers (and more). Try Before You Buy! Do not feel left out or left alone. Join the versatile family of Moon Invoice users. Download our app today and allow us to eliminate all your invoicing worries.